The Way of the Roses tour done over 4 days averages at 43 miles a day. If you would prefer a more challenging ride then please see our 3 day version. The price for the 4 day Way of the Roses tour is £445.00 per person if you are sharing a twin or double room or £545.00 if you have a single room or £595 for sole occupancy of a double room each day. Accommodation is in good standard hotels, B&B’s and country pubs. At the end of the tour you can return home from Bridlington station or we can take you back to Morecambe if you left your car at your accommodation. There is always a good camaraderie during the trip and we aim to facilitate a relaxed, friendly & memorable Way of the Roses tour. Arrive at the traditional English seaside resort of Morecambe where we will get together, ready for our adventure. Departing from Morecambe Bay the route passes through the historic city of Lancaster before passing through the picturesque Lune Valley to Hornby. Cycling through the Forest of Bowland to Clapham and into the Yorkshire Dales National Park offers more spectacular scenery before arriving at the charming town of Settle where we will spend our first night. This hilly yet rewarding day ride sees us passing the highest point of the route at 402m near Greenhow. The Nidderdale area of outstanding natural beauty is amongst the most scenic section of the ride and Pateley Bridge is a hidden gem and makes a fine stop for lunch. As we continue east the route becomes less demanding as we leave the hills behind to arrive at the Cathedral city of Ripon. A nice flat day’s ride takes us into the Vale of York through green fields and farmland and onto the historic city of York which is a fine place to visit. We will pass York Minster and cycle alongside the River Ouse before taking to cycle paths and quiet country lanes to the small town of Pocklington. Although the mileage is quite high the terrain is flat which makes for an easy penultimate days ride. Into the Yorkshire Wolds the scenery becomes more spectacular before the fantastic descent away from Huggate. Another flat section passes through Driffield and Burton Agnes before a few undulations to test the legs. The final stretch passes through Bridlingtons old town before reaching the promenade around 3pm and the end of the adventure. The tour price includes 4 nights accommodation, 4 breakfasts, 4 lunches, full trip support including a tour leader that cycles with the group, back up van with spare parts and a few spare bikes, detailed route notes and maps so that you can cycle at your own pace and luggage transfer each day. Evening meals, cycle hire, transport to Morecambe, transport from Bridlington. You will stay in a variety of places in a mixture of 3 – 4 star B&B’s, country pubs and hotels. All the places that we stay have been carefully selected on grounds of character, location, comfort and cleanliness. Hot showers will always be available so that you can get cleaned up and relax after a long day on the saddle. Your baggage will be transferred for you each day and will be waiting for you at your accommodation when you arrive. 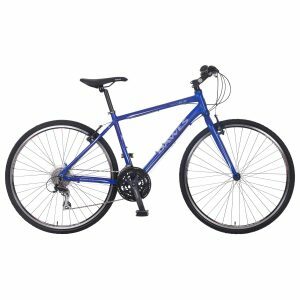 We highly recommend that you use a bike that you are used to and feel comfortable riding. 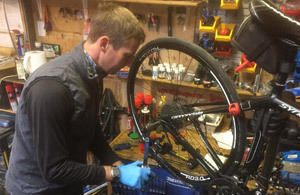 Your bike should be fully serviced and in good condition before you start, this will reduce the risk of mechanical problems and unnecessary stoppages along the way. 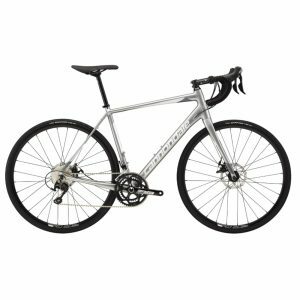 A road bike or hybrid bike would be preferable however the ride can be done on a mountain bike if you prefer. 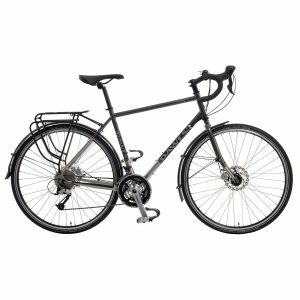 We have a range of hybrid bikes , touring bikes and road bikes available for hire (£50 – 80 per person) if you don’t have your own bike. This tour is suitable for someone with a reasonable level of fitness and who wants a challenge. If you do plenty of training beforehand you should have no problem completing the ride. It must be stressed that a good amount of training before the ride will make your tour much more enjoyable and ensure that you finish your ride. We are always happy to advise you about training plans in preparation for the ride. Clothing for all weathers is recommended so waterproofs are essential. Kit list provided. How do I get to Morecambe? Leave the M6 at Junction 34 and follow the signs for Morecambe A589. From the North Leave M6 at junction 34, join the A683 towards Morecambe. If you would like collecting from Morecambe we will meet you at the station and take you, your luggage and your bike to your accommodation where we will spend our first night. It is about 1 mile from Morecambe train station to your accommodation so if you want to cycle we can meet you at the station and take your luggage for you. Just let us know when you want picking up and we will meet you then. We will have a group meal at around 7:30 on the Wednesday night so if you are arriving much earlier you have the time free to yourself. We don’t expect you to be an expert bike mechanic but there are a few simple skills that will be a great benefit to you. The most important skill you need to know is how to fix a puncture. It is quite likely that at some point you will have a puncture or two so it is essential that you carry a puncture repair kit and a spare tube or two with you. It is also helpful if you know how to change your brake pads and adjust your brakes & gears however this isn’t essential. Our guides will help you with any repairs and adjustments en-route. Obviously each group is different but generally our groups are a fun, friendly, helpful & adventurous bunch. There will be people of all ages and from all walks of life. We tend to get quite a few older riders although there will always be a few younger riders as well. So far our youngest rider on a tour was 15 & the eldest 82. We think that a group of 20-25 is ideal as there will be plenty of people with similar interests and character without being such a big group that it becomes too much. 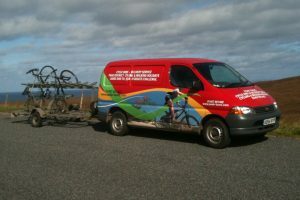 If you are travelling home by car from Morecambe then the return coach from Bridlington has a bike trailer to fit all the bikes in. If you are travelling home from Bridlington train station then the coach will take you and your bike there where you can then take it on your train journey home. 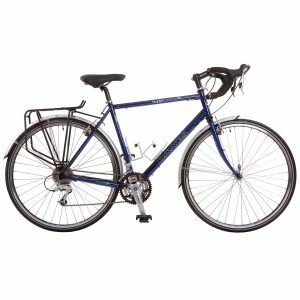 If you live near Peak Tours HQ in Glossop, Derbyshire then we can always bring the bike back here and you can pick it up from us free of charge. Alternatively we can always bring it back to Peak Tours HQ and post it back to you for which there is a £70 charge. No, the back up van doesn’t drive behind the group at all times but the van shouldn’t be too far away if you require assistance. In the morning we have a group brief and set off cycling, meanwhile the backup driver will collect all the luggage from the various B&B’s & hostels. Once all of the luggage has been loaded, the support vehicle will leapfrog the group stopping when necessary. The backup driver will be at the lunch stop should you need anything from the van and in the afternoon will go on ahead to ensure that your luggage is in place before you arrive. It is advisable to use your own bike if possible however we realise that it is not always possible to use your own steed so you may wish to hire one. 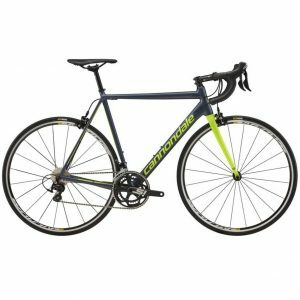 We have a range of bikes available for the tour, and details of these bikes can be seen by clicking on the ‘Tour Extras’ tab. All the accommodation was of a high standard throughout and the hosts friendly and helpful. Had no problems. As when I did LEJOG in 2015, I was very impressed with the tour organisation. I would have no hesitation recommending Peak Tours or going with you again. This is the first long distance ride that I have done but I found the route to be a good mix of minor roads with only a few major roads to cope with. The first leg on day 2 through Brimham Rocks and Fountains Abbey was simply superb. Having more hills on day 3 would have been good to add some variety, but that may not be possible as we followed a set route. Everything worked very smoothly. I didn’t feel rushed in the mornings and we had enough time in the evenings to relax before dinner. Just a quick note to say thank you for another great trip. Special thanks to Fiona for befriending my girls and getting them over the hills on day 1. All the guides lived up to your usual exceptional standards and the meals and accommodation were spot on. All the B&B’s and hotels were excellent. Clean and comfy beds, tea/coffee making facilities, lovely bathrooms and great breakfasts. Day 2 was the hardest by far but offered the best views. A wonderful array of treats from the van and a great cuppa made for us by your excellent staff. It was extremely well-planned and everything ran smoothly. What superb guides. They provided enough input and still treated everyone with the utmost respect and sensitivity. Romantic scenery, quiet roads and generally well signposted. The tour was very well organised. The brew and lunch stops were in the right places. We always had good instructions for the day. Group size: Just right because we all went with small groups and sometimes found yourself with a different group which made it good to make friends with all the group. The ride provided constant views and was a pleasure, ever-changing light, weather and company. It offered challenges for inexperienced cyclists but these were achievable with effort, which just helped the sense of achievement at the end of the day. The quiet roads selected were fantastic and really added to the experience. Really detailed and must have taken a lot of time to compile. Thank you! It was great to have these beforehand too. Superb, everything went smoothly, at least from my perspective. It was such a pleasure just to ride and choose food knowing we were supported by experienced and friendly tour leaders. As above, the combination of the personalities in the team worked really well. Graham was constantly smiling and everything was ‘brilliant’. He adjusted my gears at the end of day 1, and gave the impression that nothing was too much trouble. I had 2 punctures on the last day and Dave took a lot of time to help us, always with a smile and a relaxed manner. Hamish was also really considerate with the whole group.The balance the 3 guides achieved between being present and accessible was perfect.I think having the backup took all of the strain out of the holiday, which is why we didn’t do it independently. I have recommended the tour to friends already. Your company deserves success and the praise and repeat bookings it receives. I loved the tour experience, the mix of people, the challenge and the whole spirit, which was set by the team and their relaxed, supportive way of being with everyone. Well done Peak Tours!!! Can I work for you? ??? Outstanding. To cross the country with minimal traffic interaction is remarkable. The brew van is brilliant. When tired I soon learned to see a mirage of the red van oasis. Can’t wait for my next one. Generally the standard of accommodation was excellent. Beautiful, well planned scenic route, loved cycling past farmers fields. Excellent, very well organised. All the tour guides were excellent. Very knowledgeable and considerate. Great fun too! Have already recommended Peak Tours to my friends. Keep up the good work! Hats off to Tony and Paul – great job! Excellent. Challenging climbs, especially the one out of Settle – real killer that one. I have used Peak Tours before and the food stops were excellent – same service provided here. I would recommend Peak Tours to any cyclist. Thanks for a wonderful WOTR. Graham, Hamish and Dave could not have been more professional, sensitive to us all and courteous at all times. It was a pleasure to be on the trip. I felt comfortable and safe at all times. I will definately recommend Peak Tours. Only one word to describe the tour, leaders and organisation...FABULOUS! Hamish and Niv were very thoughtful regarding the group's needs and nothing was too much trouble. Thanks to all - would book again with you and hope to in the future. Very well organised and all of the information provided in advance. I had questions that were answered really quickly. This was my 3rd trip with Peak Tours. Great tour, well organised. Our guides Niv and Hamish were first class. I would recommend this company and trip to everyone. We were well catered for throughout the trip and it was possible to eat very healthily. The group was a lovely size and worked well together. Graham, the guide, was very skilled at managing a very complex operation. It was also very clear that the trip had been very thoughtfully put together. Everything excellent. Tom and Phil were so helpful. I really can't say how it could be improved. The brew van was great and all the lunches were excellent.The organisation was excellent. Beyond excellent, I couldn't be happier. Excellent says it all and we would do another tour with you again. The route was challenging in parts, interesting, largely traffic free and in most parts the surface was good. All meals were excellent - there was a good choice and whatever was served was always good. Enjoyed every minute - the best few days I've had in a long while. Completing 170 miles over 4 days was just right, allowing us plenty of time to look around the villages and towns in the evening before dinner. Phil and Tom were fabulous - always there when they were needed. Yet another excellent tour with a great group and great organisation, made all the more pleasant thanks to Phil and Tom's efforts. Congratulations to all the group for completing the route and many thanks to you for organising the whole trip. Graham and Phil were very helpful throughout with the tea stops a highlight of the day (I think Graham slightly edged the table layout). This was my first cycling trip which I enjoyed so much that I will be looking forward to hearing about the new tours for next year. The tour was so well organised, I couldn't find any critisism. Thank you for a great tour. What a great 4 days a great tour and company. Your staff Phil and Graham are indispensable and a great asset to your company. This tour was well organised and a great personal achievement for myself, it also gave me 4 days with my son Elliott priceless father and son time , so once again thanks to everybody concerned and to top it off we raised over £2000 for charity. thanks for organising and managing a great trip. Graham & Phil were an inspiration. Nothing was too much trouble and they were always cheerful. The tour was perfect, even with the slight headwind we experienced. Thank you for another excellent tour. It was so good of you to pop up to see us all, I know how busy you are. The organisation was superb as usual. Special thanks to Graham and James for making it feel like "a ride out with your mates". The accommodation and meals were excellent, as was the company! I wish you and your company continued success and I'm looking forward to my next tour with you! Many thanks for a brilliant job, once again, and it was good to see you on Thursday for dinner. Please pass on my regards to Graham and James for their professionalism with a sense of fun. Will definitely ride with Peak tours again, perhaps in Europe next year!!! Thanks for a wonderful trip. We were impressed by the way the trip was organised. The brew stops – the dried fruit and the fruit tea were lovely touches and it was clear that you’d thought more about what people may want than providing snacks to a cost. The route was beautiful. The scenic time of year and fabulous weather undoubtedly contributed, but that aside the route was well-planned and avoided major roads. The van snacks were always welcome and were varied and well-thought through and it was a real treat to discover that lunches were included (maybe if I had read the pre-trip information I would have known this). Steve & Graham were amiable, efficient and well organised, you really enhanced the trip. The tour was excellent. Not a mark I would normally give lightly but well deserved in this instance. Having a free choice at lunch was more than expected and the venues were very good. The selection in the van was again above my expectation. The tour was great - I really enjoyed it and will recommend Peak Tours to friends. Breakfasts were all very good. Lunch breaks were good too. The tea breaks and pork pies were all very welcome.